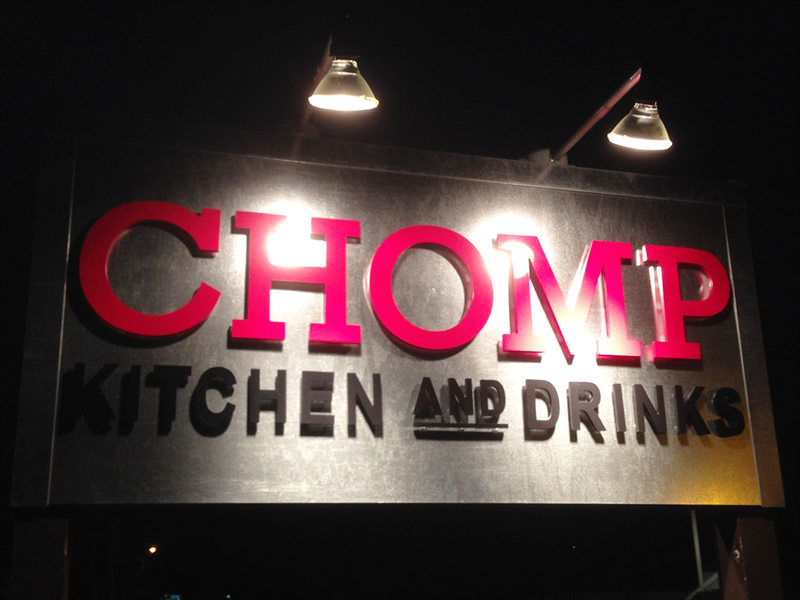 Chomp is truly a hidden gem nestled on the edge of Warren, RI. I only noticed it while driving by one day because the restaurant seemed to pop up out of nowhere like an oasis. It’s a little out of place in a woodsy neighborhood, but does not seem to be lacking in a strong showing of customer support. I knew I had to check it out and Chomp made a great first impression on me that will have me returning again soon. Chomp is a tiny restaurant. It’s not as small as some places, but it’s not nearly large enough to fit the number of people that flood into the restaurant on weekend nights. That’s a good problem for the restaurant and a bad problem for its patrons. Nonetheless, people seem happy to crowd around the small bar area while they wait for a seat at the bar or in the small dining room. There is also outdoor seating, but of course that’s only comfortable on warmer nights. The service at Chomp is pretty excellent. When I went with my wife, we sat at the bar after waiting a few minutes for a nice couple to leave and offer us their seats. The bartender that took our drink and food order was extremely nice and helpful. He gave us tips about interesting beers they had on tap that night and his opinion about some of the food choices. The owner of the restaurant even checked in on us, which I always find to be a nice touch in small restaurants. The food in general at Chomp seems like an overall win. Everything we tried had its charm and unique spin on traditional takes. Most of those unique takes on dishes worked really well and while nothing we tried was less than good, there were a couple of items that I thought could have benefited from a simpler approach. 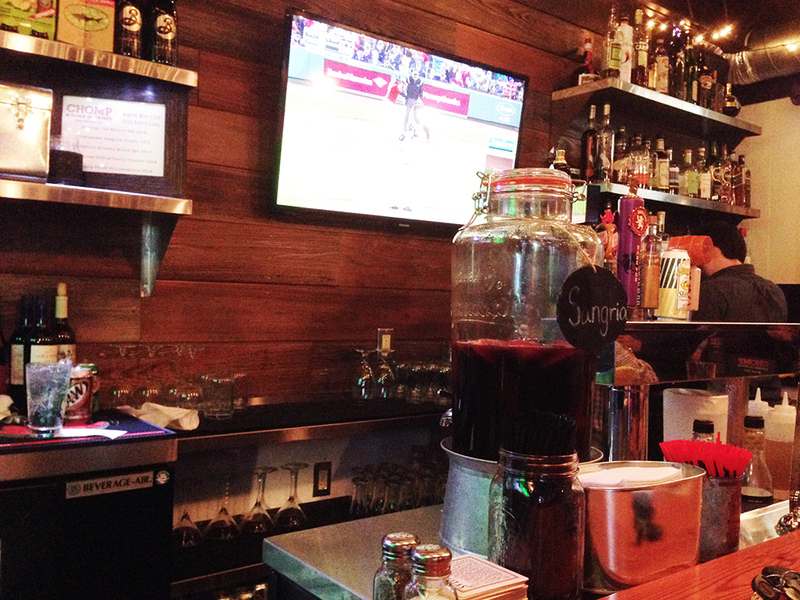 Drinks – Lagunitas, Green Flash Road Warrior, and House Sangria. 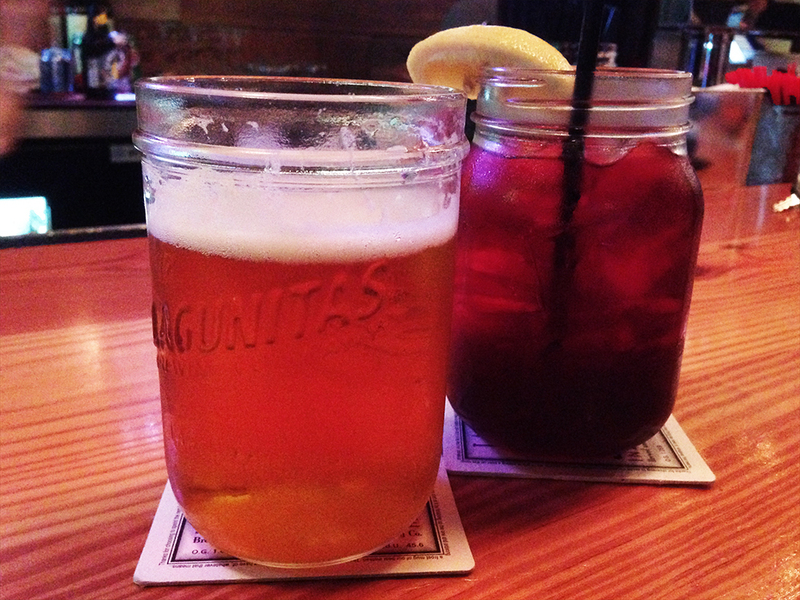 I had a Lagunitas IPA that came in a mason jar with Lagunitas written across it. I know that a lot of people now consider mason jars as belonging to insufferable hipsters, but since I was a kid I’ve always enjoyed drinking cold drinks out of mason jars on warm days, so I appreciated it. If you ever get annoyed by someone drinking out of a mason jar, just remind them that the trend truly belongs to old country folk and Bugaboo Creek patrons from the 90’s. My wife tried the house made sangria, which would have been really good (i.e. not too sweet and with good wine flavor) if they didn’t use raspberry flavored vodka. I’m not especially fond of flavored vodka because it often tastes medicinal. The house sangria was great except for that one layer of cough syrup-like flavor. Lastly, the bar tender recommended a beer called the Green Flash Road Warrior that I enjoyed very much. It was a darker IPA with a high alcohol content, but not overpowering. Frickles – Fried Pickles. 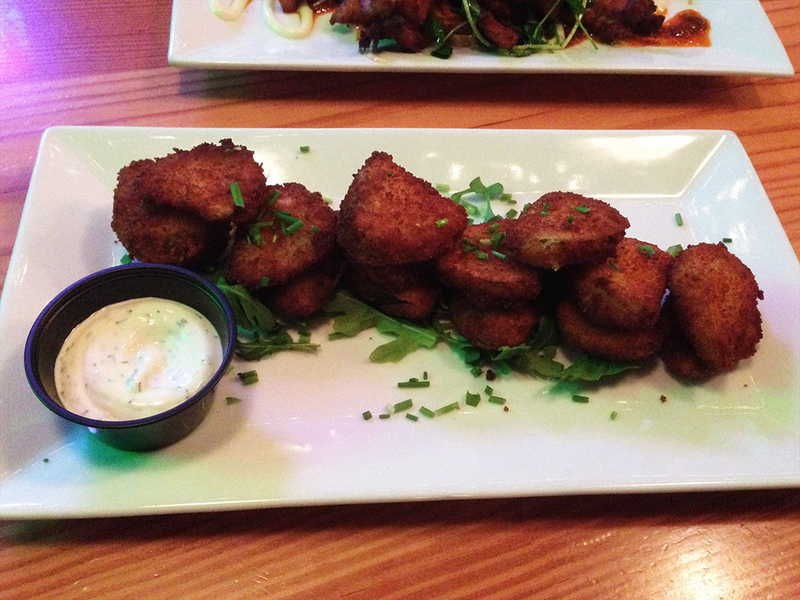 These fried pickles were fantastic. The breadcrumb coating over the pickles stayed crisp and the pickles themselves weren’t overly sour like those blindingly yellow ones you buy from the grocery store. Instead, the pickles tasted more like deli pickles, which are more balanced. Paired with the house made dill mayo and the result was truly an amazing dish. The dill mayo added a refreshingly cool taste to the fried, salty delicious pickle slices. I would highly recommend these southern style treats. 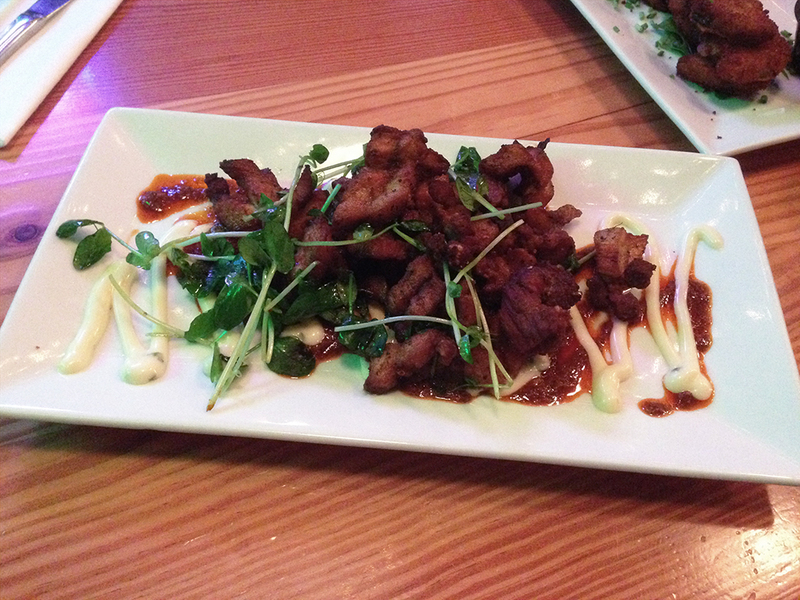 Chicharron – Pork skin/rinds/belly. Let me put a disclaimer on this dish before I go over it. This wasn’t a bad dish. In fact, it was pretty good although I found it a little heavy on the cumin. With that said, I was also the most disappointed in this dish. It is called “Chicharron,” and it may be a preparation that I’m not familiar with, but it just isn’t the chicharron that I’m used to or that I have come to love. This dish had pieces of pork meat and fat, cut up into small pieces and heavily seasoned. Again, it wasn’t bad, but I just prefer a simpler take on chicharron, which is a little salt, pepper, and fried. There is so much flavor in chicharron that I just didn’t think it needed all the dressing up. Truthfully, if Chomp just called it something other than chicharron, I probably would have been a fan if it had just a bit less cumin. The presentation was beautiful though. 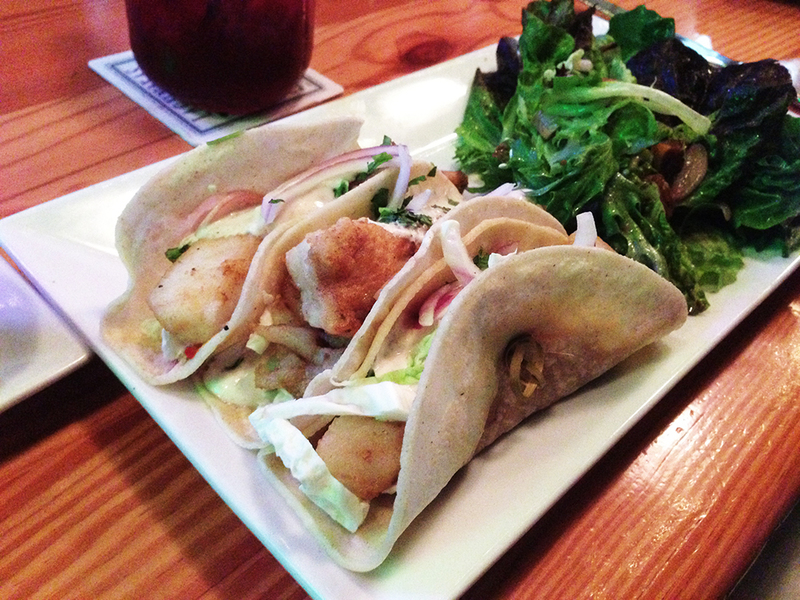 Fish Tacos – My wife got the fish tacos, which were made with lightly fried cod pieces wrapped in corn tortillas. The three tacos were also dressed with cabbage, red onion, pickled radish, salsa rojo, mint & cilantro salad, and a lime crema. I tasted the tacos and found them very light despite having fried battered fish inside them. The cabbage and onion added some crunch while the crema gave the tacos a cooling taste perfect on a warm night. A lot seemed to go into the tacos, but the overall flavor effect seemed simple enough. The only drawback was that all of the dressing of the taco seemed to cause the fish breading to soften instead of remain crispy. I would consider this a successful dish that creates a familiar palate of flavors, but with a lot of technical detail behind it. 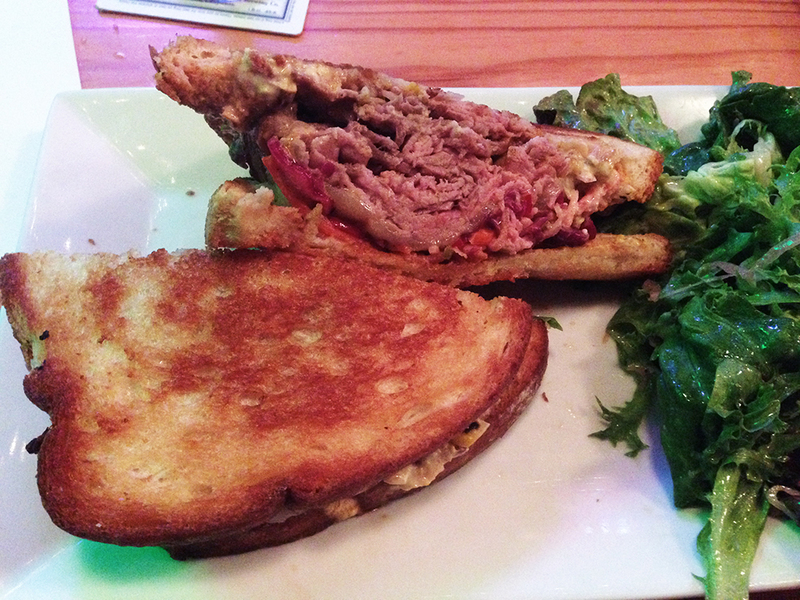 Smoked Barbecue Beef Sandwich – I wasn’t sure if I should get the beef sandwich or the pork belly sandwich, but the bartender recommended the beef sandwich as one of his favorites. I went with his recommendation and I wasn’t disappointed. The huge toasted sandwich came out stacked with deliciously smoky top round beef slices. The sandwich had a lot going on, but everything worked together perfectly. The sweet mayo worked with the jalapeno slaw, the cheddar cheese, and the tangy house barbecue sauce. The barbecue sauce wasn’t sloppy either, which often happens at places that don’t pay much attention to detail. 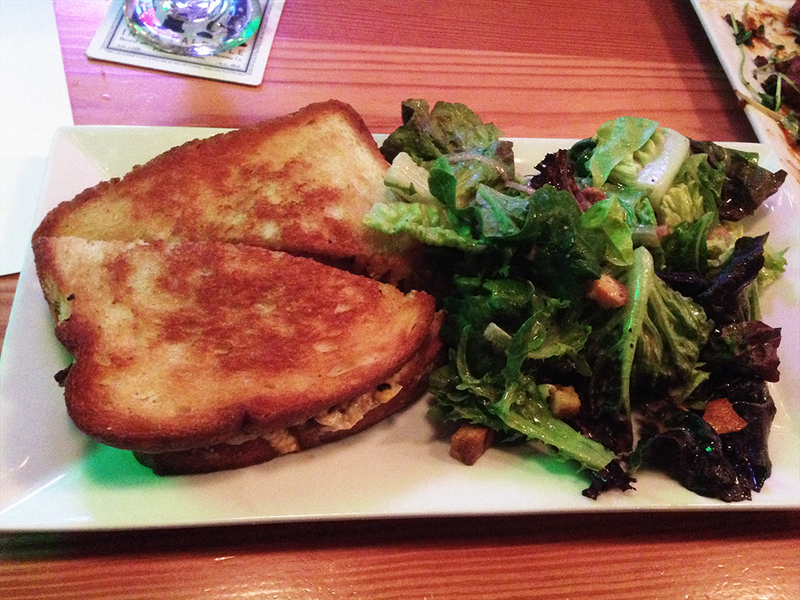 It may be the sauce that has the extra cumin flavor, but there was again a noticeable cumin flavor to the sandwich. Luckily, it wasn’t overpowering like it was in the chicharron. The sandwich was relatively heavy as well, so after already eating and drinking so much, I couldn’t finish more than half of it. I ended up taking the other half of the sandwich home to re-heat and eat it the next day. It turns out that it reheats in the oven very well, so that was a nice surprise. I would easily recommend this sandwich to anyone looking for some hearty, smoky, barbecue flavor. I highly recommend Chomp to anyone looking for a great place to eat in eastern Rhode Island that is also outside of Providence and a little off the beaten path. They are apparently known for their burgers although all of their food appears to be very good. They have an impressive drink selection and all of their dishes are expertly put together with unique, complimentary flavors.